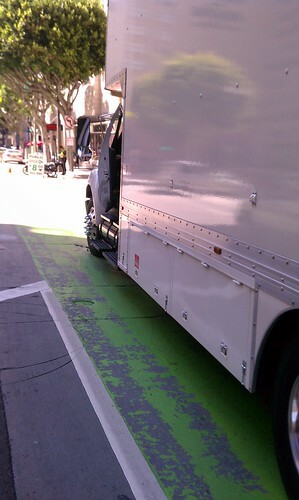 A production truck blocking the Spring Street bike lane. Since passing the bike plan Mayor Villaraigosa’s administration has taken an aggressive stance on bike projects borrowed, perhaps, from the redneck comedian Larry the Cable Guy: “Git ‘r done.” Unlike Larry the Cable Guy, Villaraigosa is in charge of a big city, and his bike lanes confront the everyday interests of people and industries that are used to getting their way in the right-of-way. Our big city Spring Street bike lane is being confronted with all the usual big city crap – work trucks, construction, lazy op-ed writers. 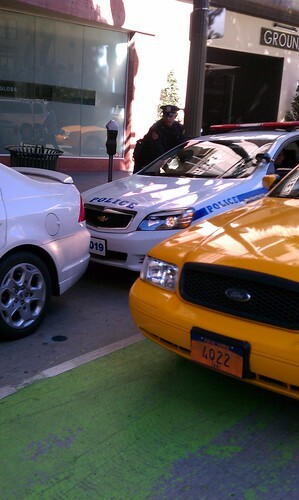 Since we’re also home town to the entertainment industry, we also have The Biz blocking our lanes too. LA, it’s a helluva town. In an era when most major American cities have installed green lanes in this exact same shade; in an era when digital effects masters and amateurs on a laptop alike can put together eye-fooling special effects – LA is not losing film shoot business because of some green paint on the road. 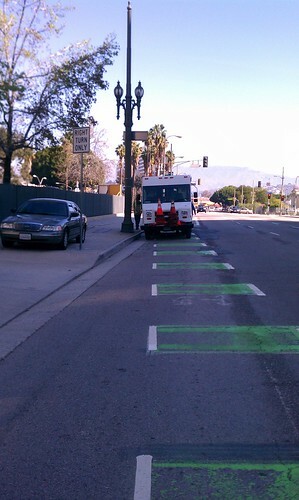 As a big city paper, the LA Times abused it market reach and spread a myth about this federally approved green painted bike lane – when the truth was so much more believable. “[I]t didn’t take long for the bike-hating LA Weekly to ferret out the reason behind the reason. The day after the LA Times article, I had a bike delivery to do in Downtown. 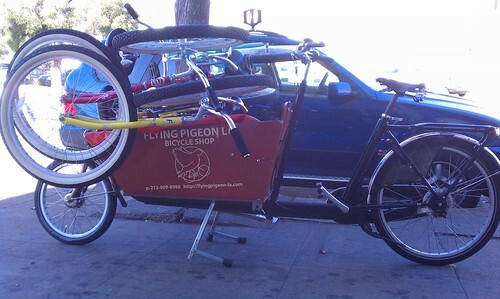 I loaded up the bakfiets and got on my way. As I made my way through Chinatown, I passed, and was passed by, three other cyclists. We all caught up to each other at the intersection of North Spring Street and Cesar Chavez – all of us were using the Spring Street green bike lane! This had never happened to me before. Usually, I see someone riding and we hang together for a block or two until they veer off course – because prior to high quality bike lanes, one crap street is as good as the other. Further down Spring, I ran into something both funny and sad. This is LA playing NYC in a big film shoot in a bike lane that the major periodical of note said was film-industry-unfriendly. Ah, the shades of grey! The controversy! Does LA have an awesome green bike lane? Yes. Do the usual suspects block it with impunity? Yes. Do lost drivers in downtown, checking their “smart” phones, ignore it completely? Yes. This is a big city, and you take the good with the bad and hopefully end up with a balance that keeps you coming back for more.